Scan slide B-36 (H&E [10x, 20x] [10x, 20x). 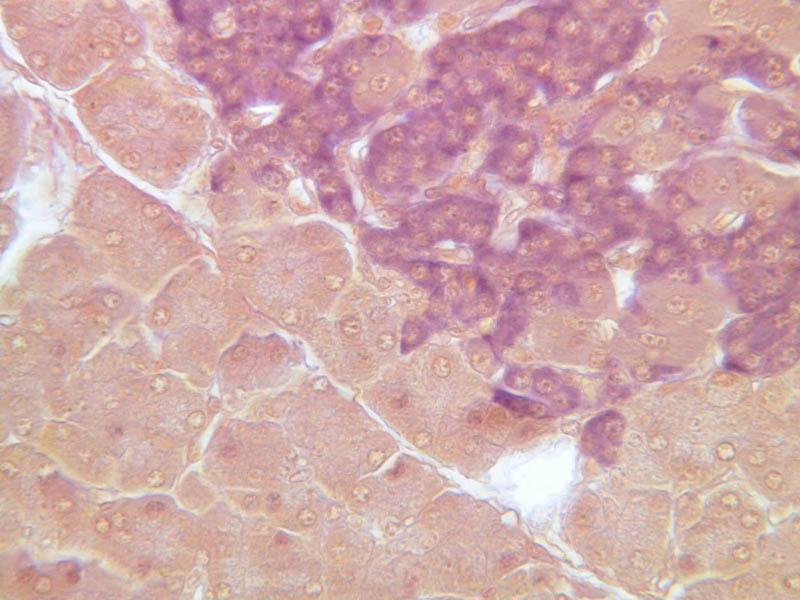 Note that in this H&E preparation most of the pancreas consists of rather compactly arranged, darkly stained cells. 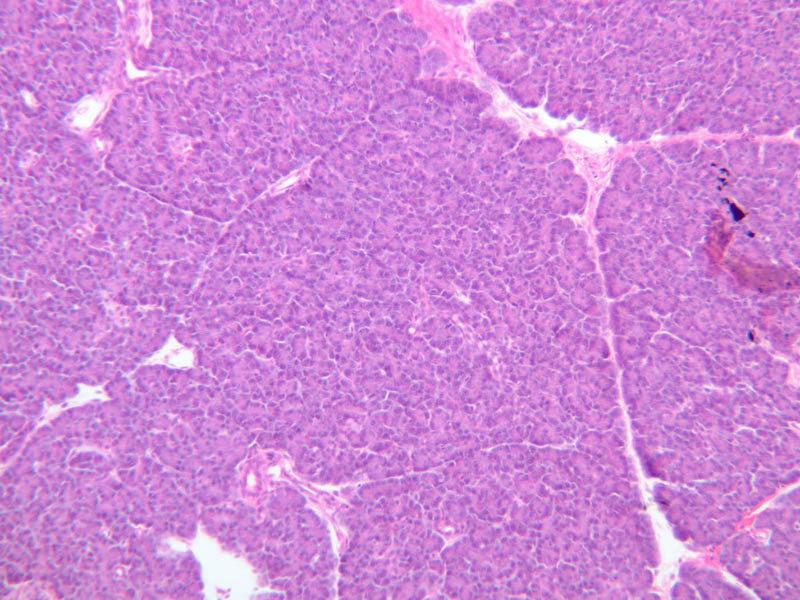 The compact, darkly stained regions constitute the exocrine portion of the pancreas. 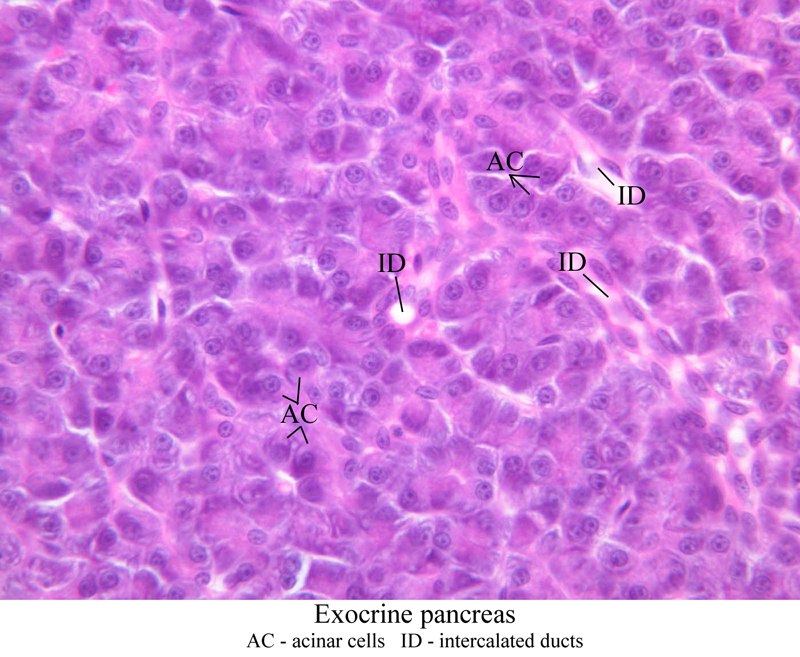 (Of what organ does the exocrine pancreas remind you?) 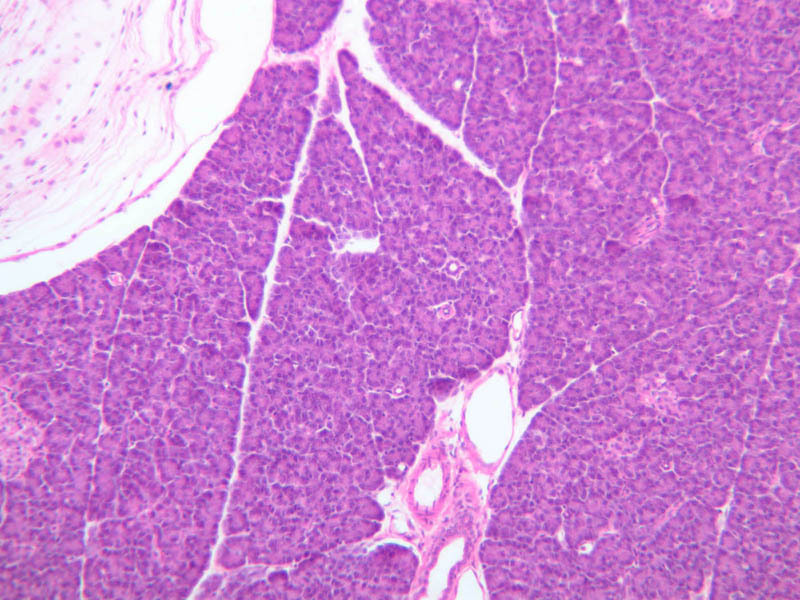 The endocrine portions of the pancreas consist of small bits, or islands, of more lightly stained tissue that is somewhat irregularly dispersed within the substance of the exocrine pancreas. 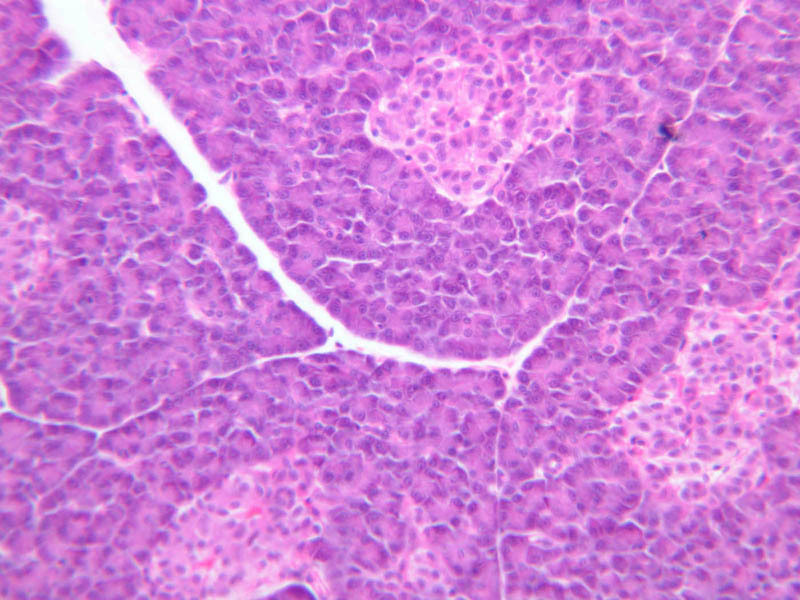 Drawing on the name of their discoverer, the endocrine portions of the pancreas are known as the islets of Langerhans. Using the high dry objective (B-36, H&E [40x, 40x-labeled]), study the structure of several acini. 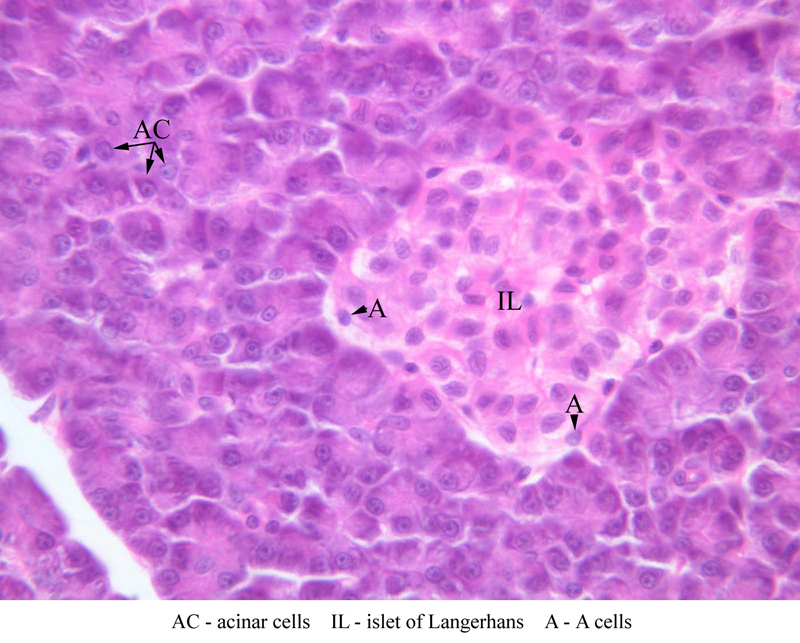 Note that the acinar cells are pyramidal in shape; note also that the acinar cells are clearly polarized: their basal cytoplasm (periphery of acinus) is quite basophilic, owing to large accumulations of RER, whereas their apical cytoplasm contains many acidophilic granules (zymogen granules) (B-36, H&E [10x, 20x, 40x-labeled]). Now turn your attention to the system of pancreatic ducts. 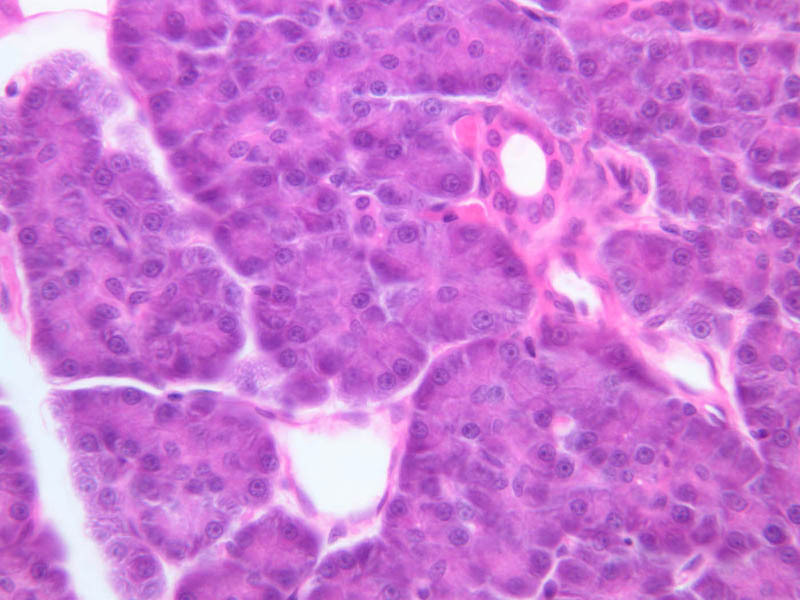 As you look for duct elements, bear in mind that the nuclei of duct cells tend to stain more lightly and to have less prominent nucleoli than do those of acinar cells. 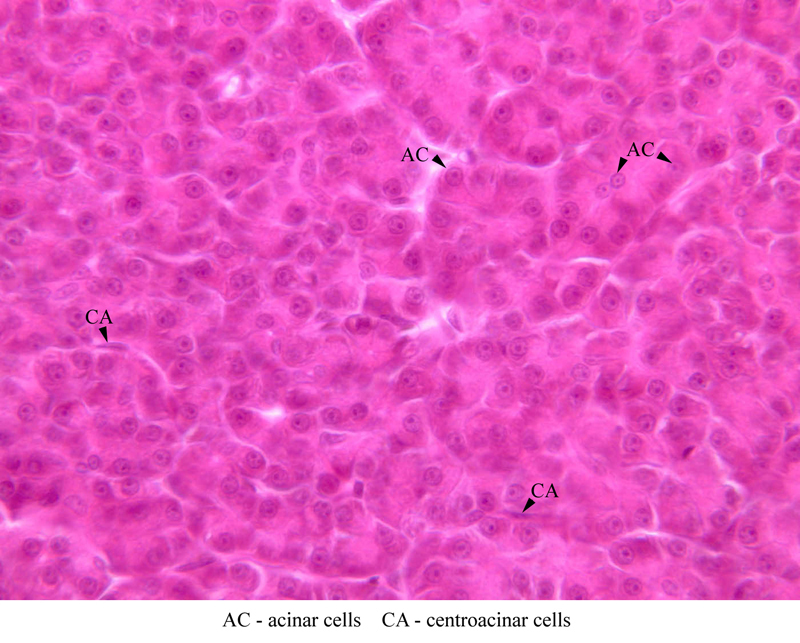 Begin by studying a number of different acini until you have identified several examples of centroacinar cells, which represent the initial segment of the duct system. 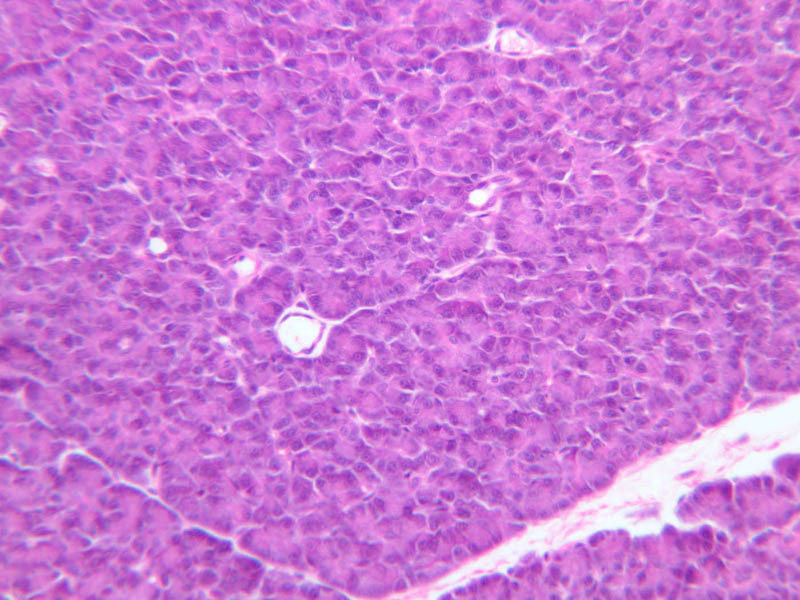 Centroacinar cells are usually evident as lightly stained nuclei that lie, individually or in clusters of two or three, near the center of an acinus. Now look along the boundaries between acini for intercalated ducts (B-36, H&E [10x, 20x, 40x-labeled] [10x, 20x, 40x]), which appear in longitudinal section as trains of elongate, lightly stained nuclei and in transverse section as closely spaced, lightly stained nuclei surrounding a small lumen. Intercalated ducts drain into intralobular ducts, which are distinguished by their larger diameter. It is best to use the 10X objective as you begin your search for intralobular ducts (B-36, H&E [10x, 20x, 40x-labeled] [10x, 20x, 40x]). You want to be on the lookout for arrays of closely spaced nuclei surrounding a lumen. 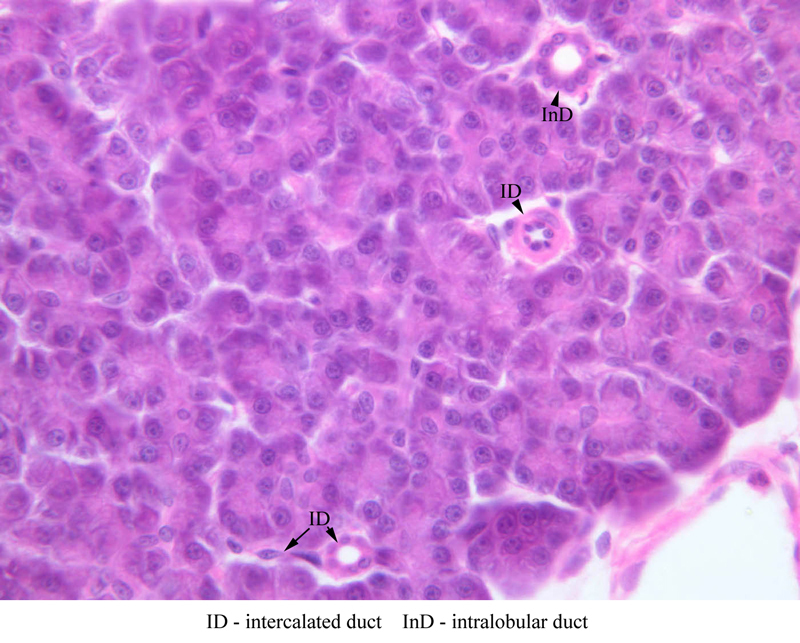 Conclude your study of the duct system by examining the connective tissue between pancreatic lobules for interlobular ducts, which may vary in caliber and epithelial lining (B-36, H&E [10x-labeled, 20x, 40x]). 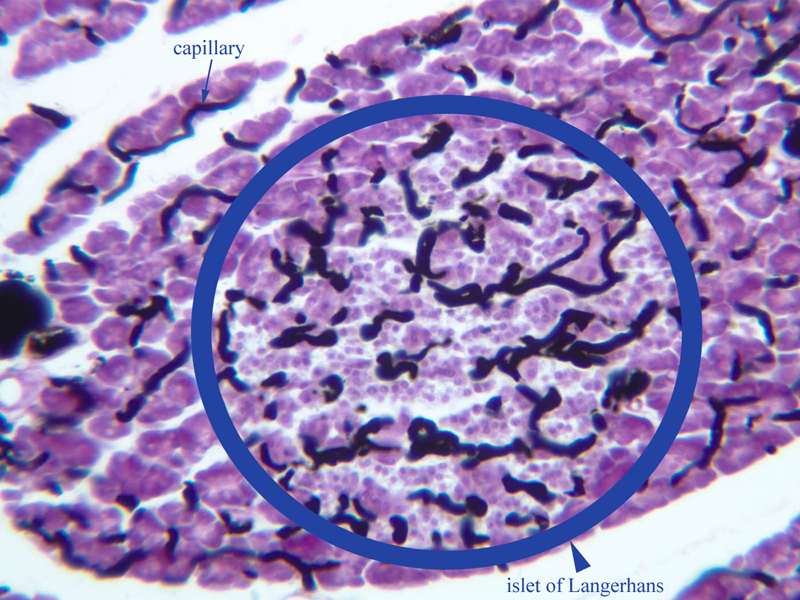 Although H & E staining permits ready identification of the islets of Langerhans, it does not permit differentiation of the various cell types that comprise the islets (B-36, H&E [10x, 20x, 40x-labeled]). 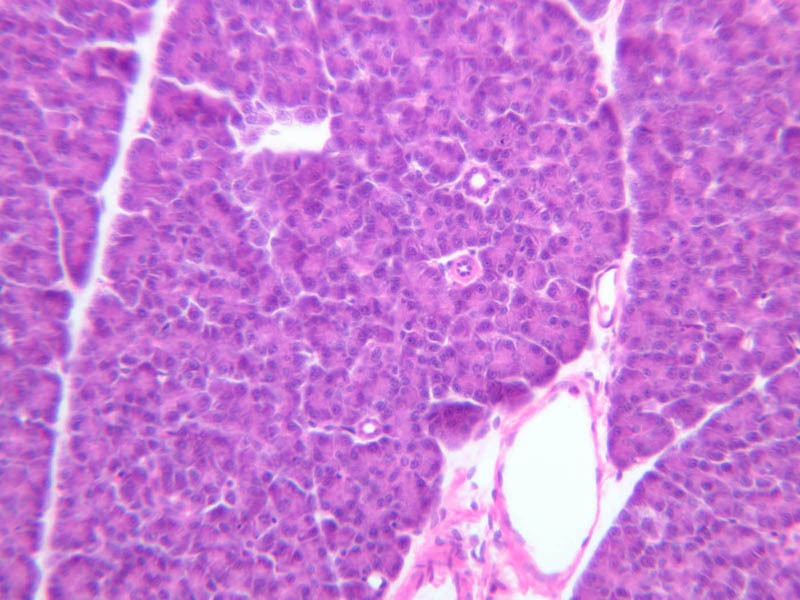 There are no slides in the class collection that permit identification of all of the cell types of the endocrine pancreas. However, the sections on slides B-37 and B-40 permit specific identification of two cell types. 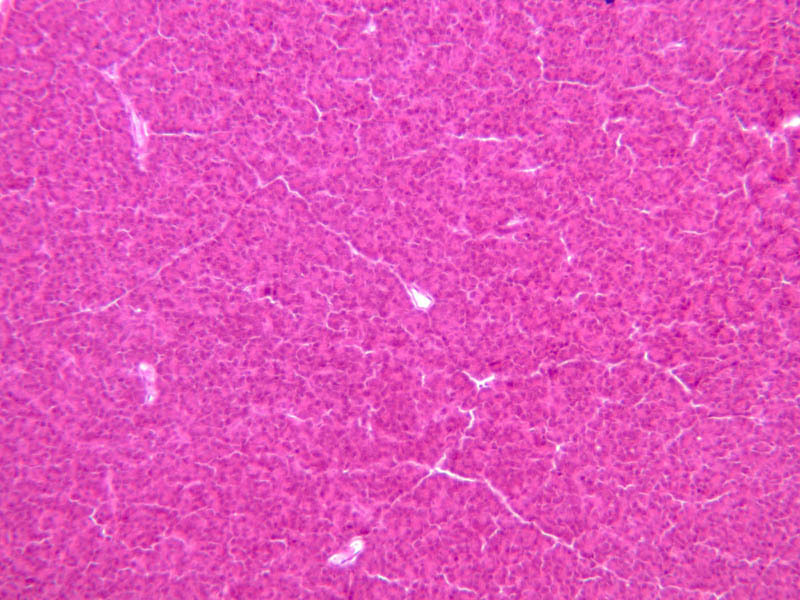 Slide B-37 has been stained by the aldehyde fuchsin technique, which lends a magenta coloration to the granules of the insulin-producing B-cells. 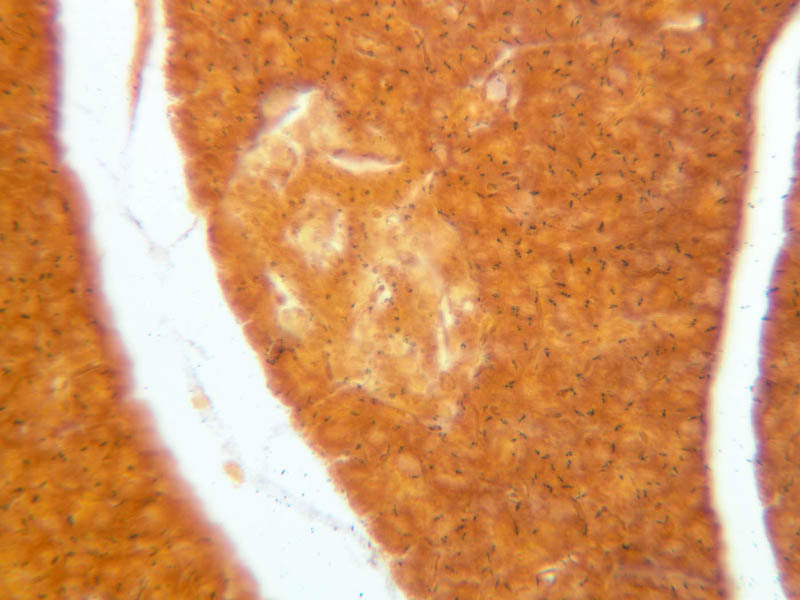 All other cells in the islets stain a dirty orange color (B-37 [10x, 20x, 40x] [10x, 20x, 40x]). 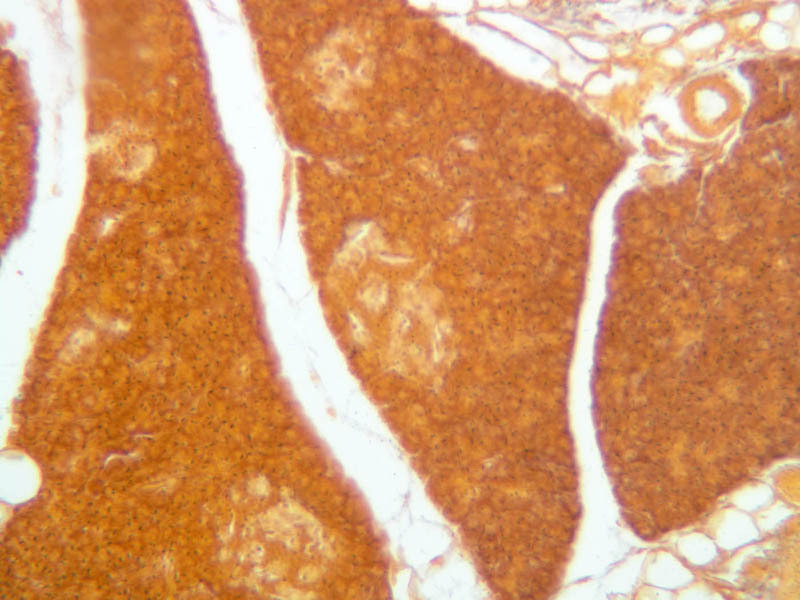 Most of these orange-colored cells are the glucagon-secreting A-cells; however, you should bear in mind that somatostatin-secreting D-cells, as well as APUD cells that secrete pancreatic polypeptide are also scattered about the islet. 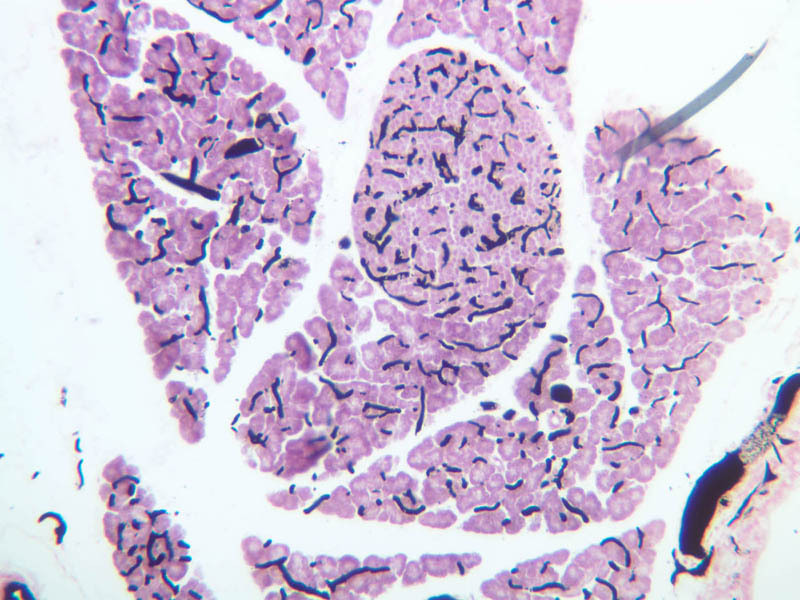 The section on slide B-40 has been prepared by a silver impregnation method that renders some of the APUD cells in the islets (which appear as “clear cells” in ordinary preparations) dark brown or black (B-40 [10x, 20x, 40x]). The specimen on slide B-39 was prepared by perfusing India ink into the blood stream of an animal. 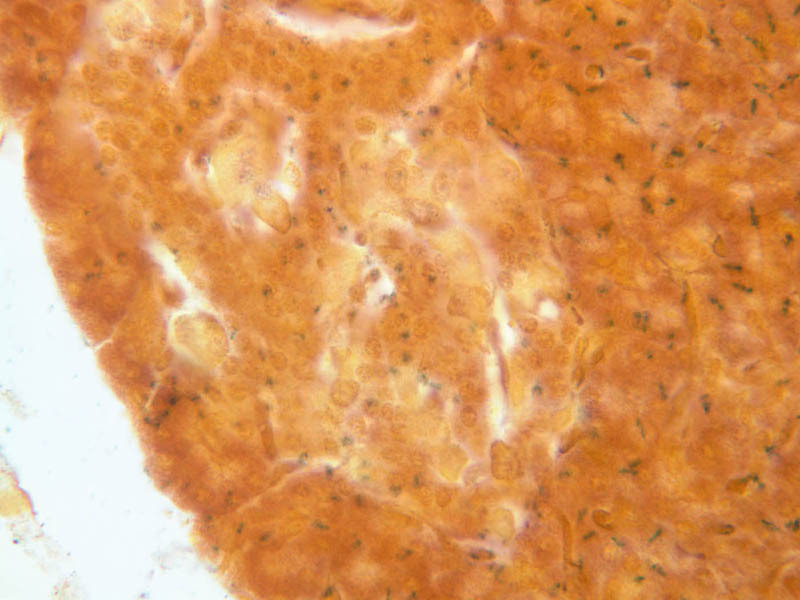 Examine this specimen with an eye to understanding how the capillary beds of the exocrine and endocrine portions of the pancreas differ (B-39, Ink/H&E [10x, 20x-labeled] [10x] [10x, 20x]). 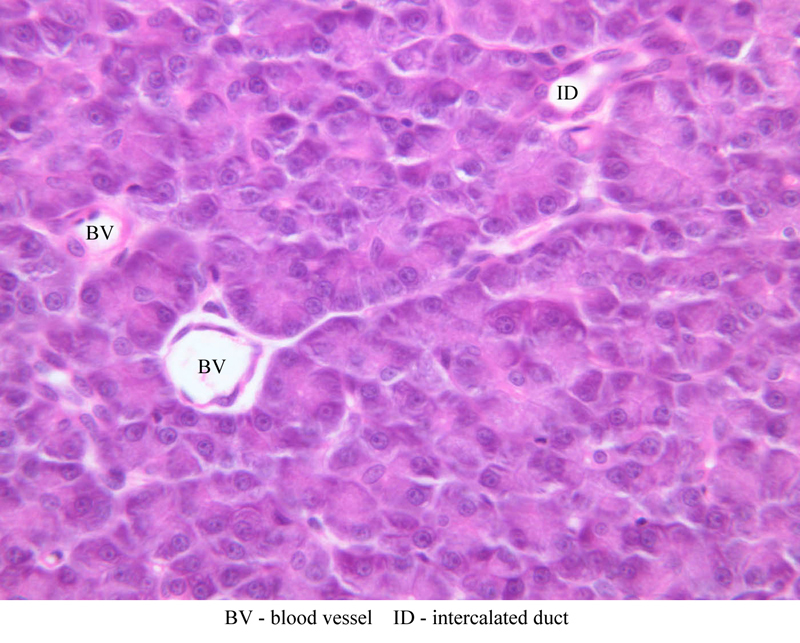 Examine the H&E-stained sections of liver (slides B-29 [10x, 20x, 40x-labeled] [2.5x-labeled, 10x, 20x, 40x] [10x-labeled, 20x, 40x-labeled] and B-30 [2.5x, 10x-labeled, 20x]). At low power, identify the connective tissue capsule (Glisson’s capsule), central veins and portal triads (portal canals). 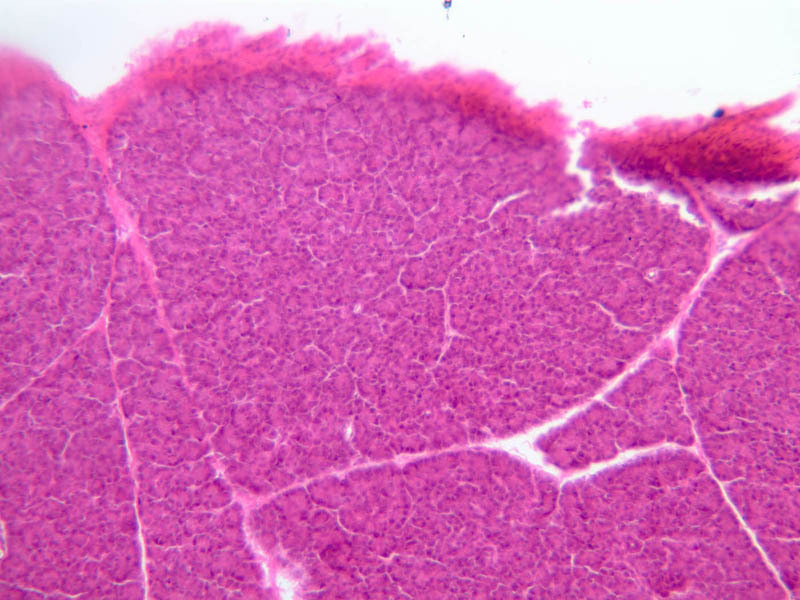 Note that the cells of the liver parenchyma (hepatocytes) appear as cords--more accurately, plates--of cells that radiate out from the central veins and partially enclose blood spaces known as hepatic sinusoids. 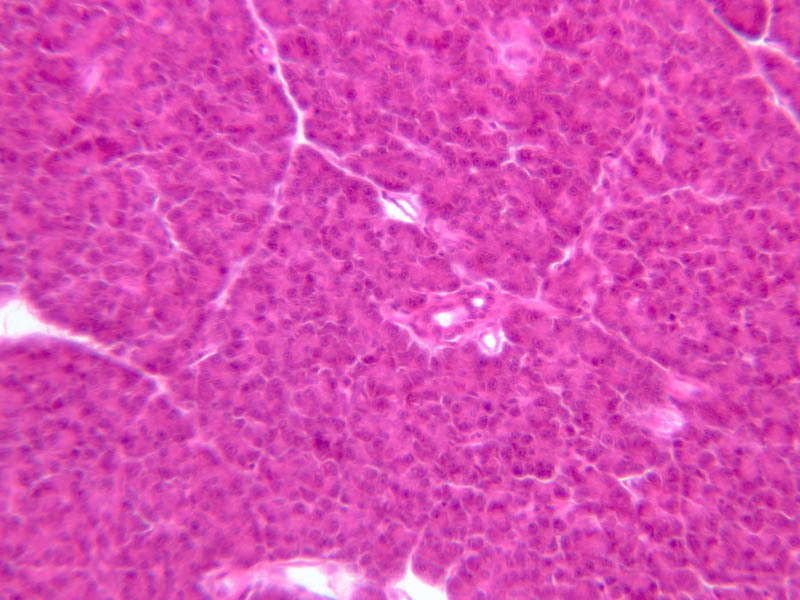 Note that the plates of hepatocytes appear to branch and fuse and that, as a rule, they are only one or two cells thick. 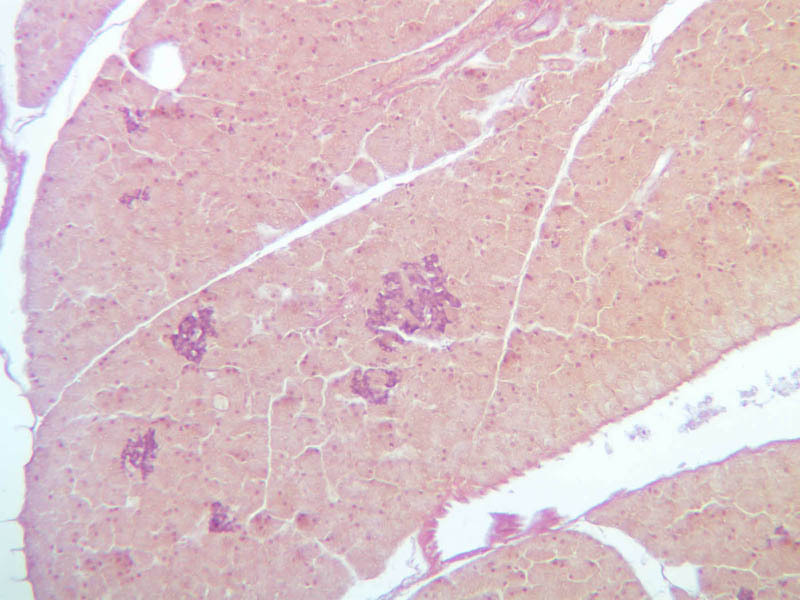 Do you see any binucleate hepatocytes? Using the 10X (B-29, B-30)and 40X (B-29) objectives, examine several portal triads, noting the variable number of profiles of hepatic artery, portal vein and bile duct that comprise the portal triad. 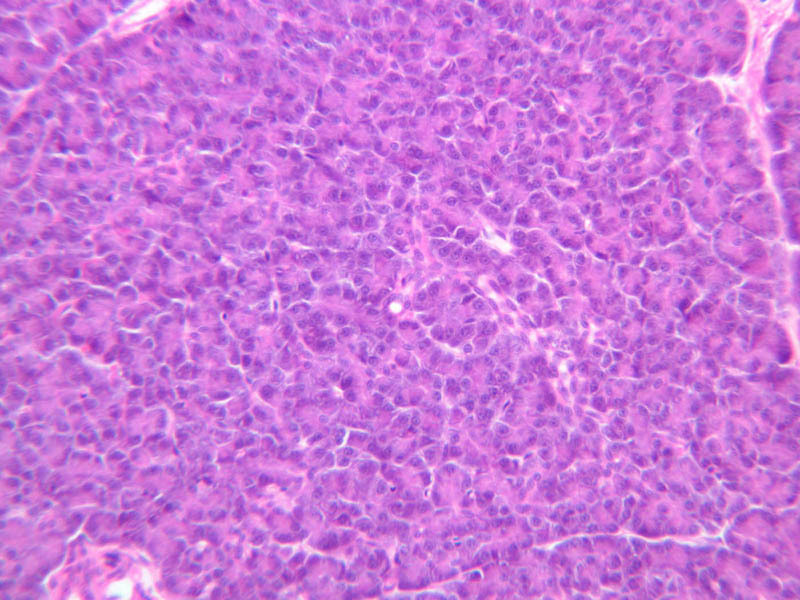 Near the boundary between adjacent lobules, try to find some of the small elements of the bile duct system known as canals of Hering. Using the high dry objective, study the lining of the central vein and hepatic sinusoids (B-29). 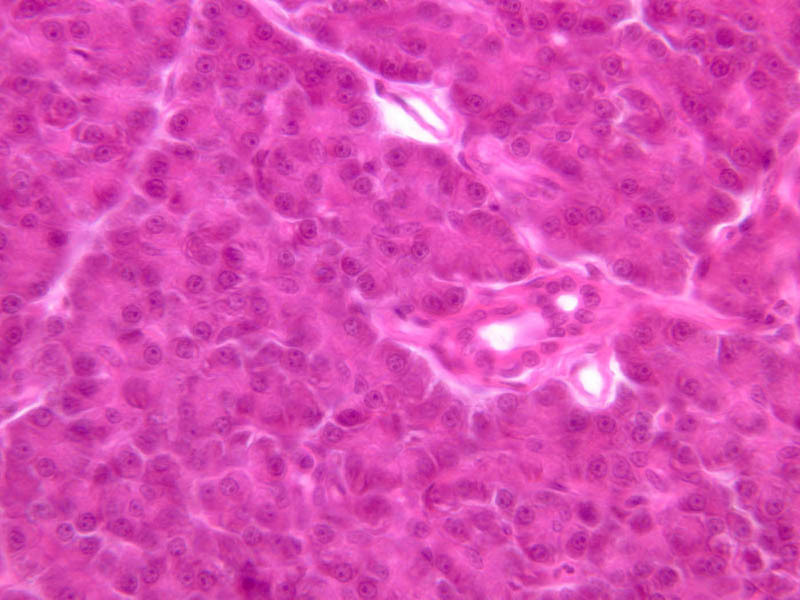 In some places the hepatocytes are exposed directly to the sinusoidal lumen, but, as a rule, there is a basal lamina which supports a discontinuous mosaic of endothelial cells and specialized phagocytic cells known as Kupffer cells. 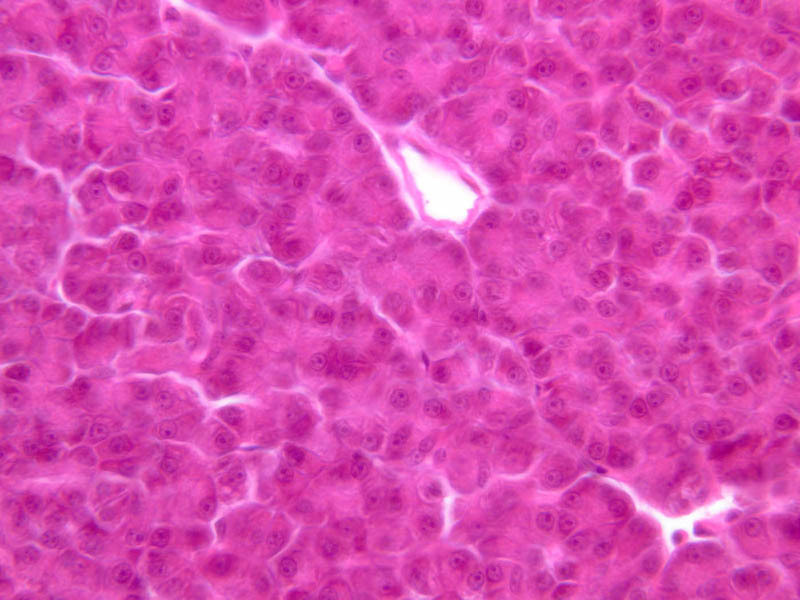 Find examples of Kupffer cells and endothelial cell nuclei. 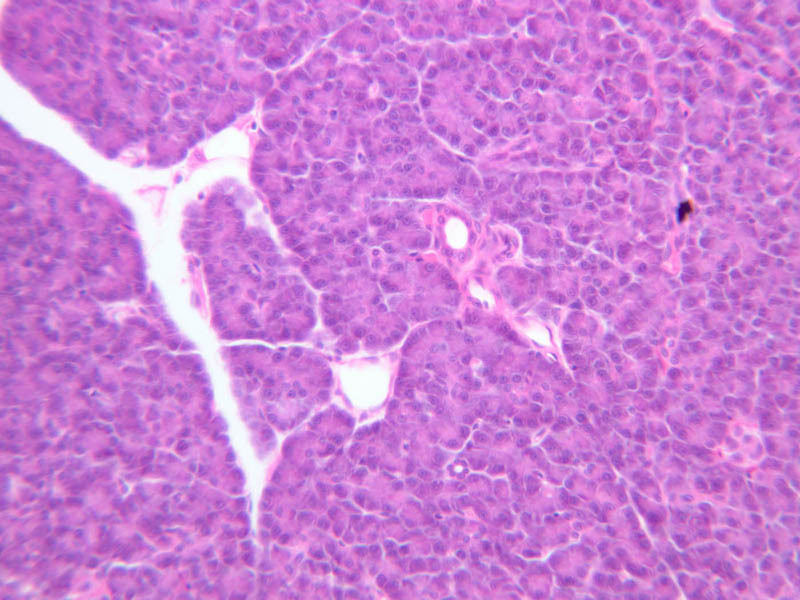 Note that in some places you may see a narrow space (the space of Disse) between hepatocytes and the basement membrane underlying endothelial and Kupffer cells. 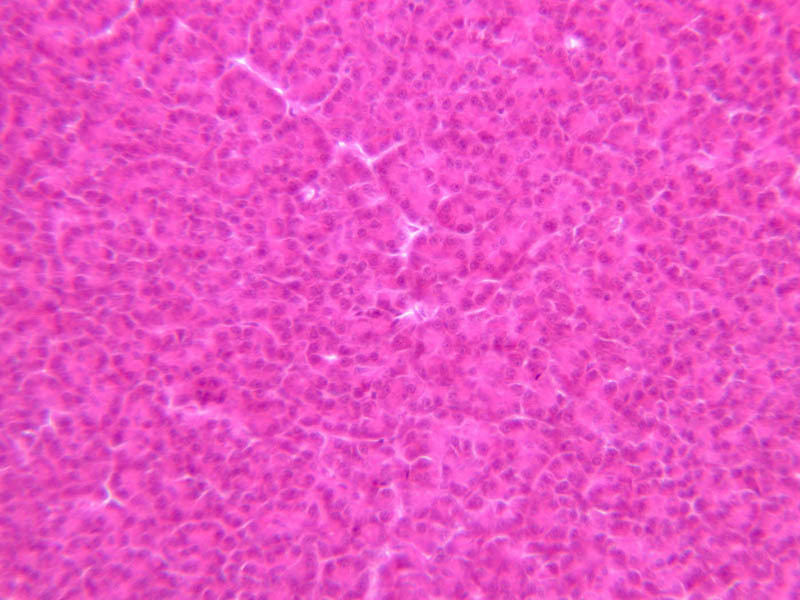 Using the oil immersion (100X) objective, look very carefully along the boundaries between adjacent hepatocytes to see if you can find a bile canaliculus--the most delicate portion of the bile duct system--the walls of which are formed by the plasma membranes of adjacent hepatocytes. 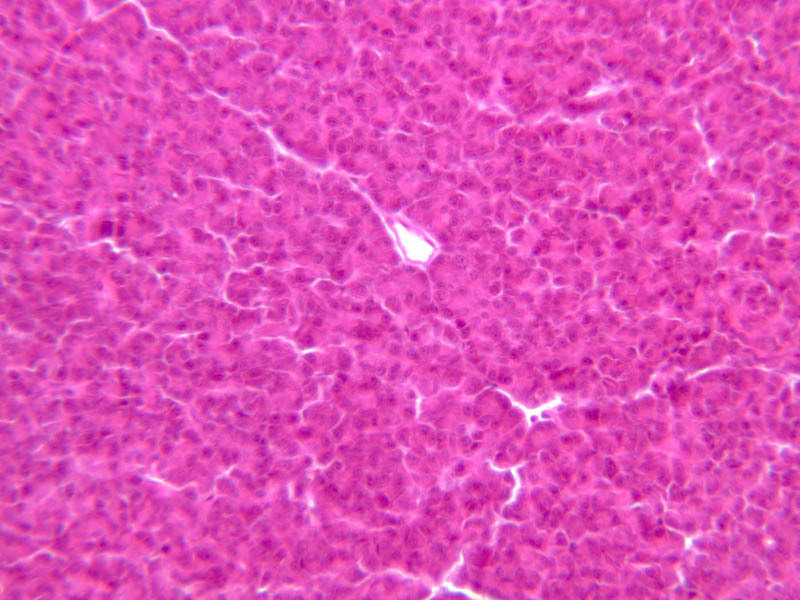 A section of liver from an animal injected with trypan blue appears on slide B-28 ([10x, 20x, 40x-labeled] [40x] [20x, 40x] [40x]). 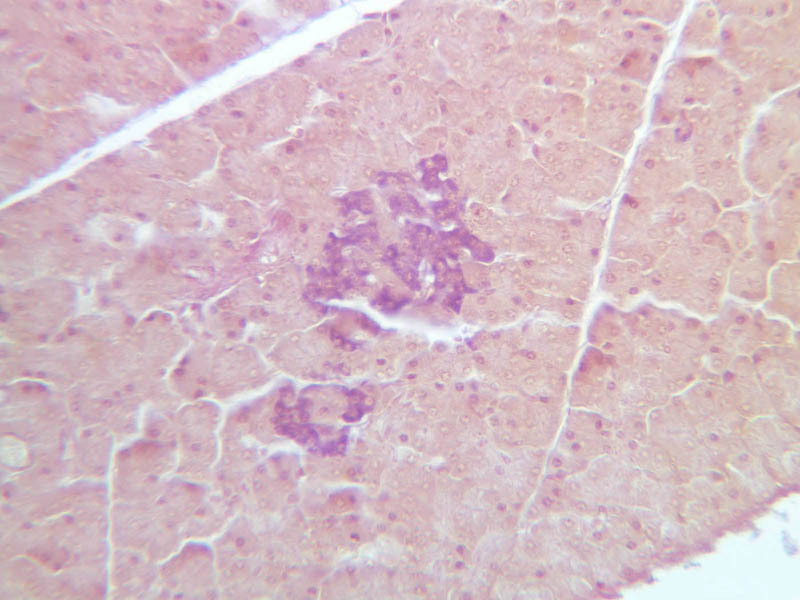 Even though the staining of this section has a very washed out appearance, it is still possible to identify a number of Kupffer cells that have ingested particles of the trypan blue dye. 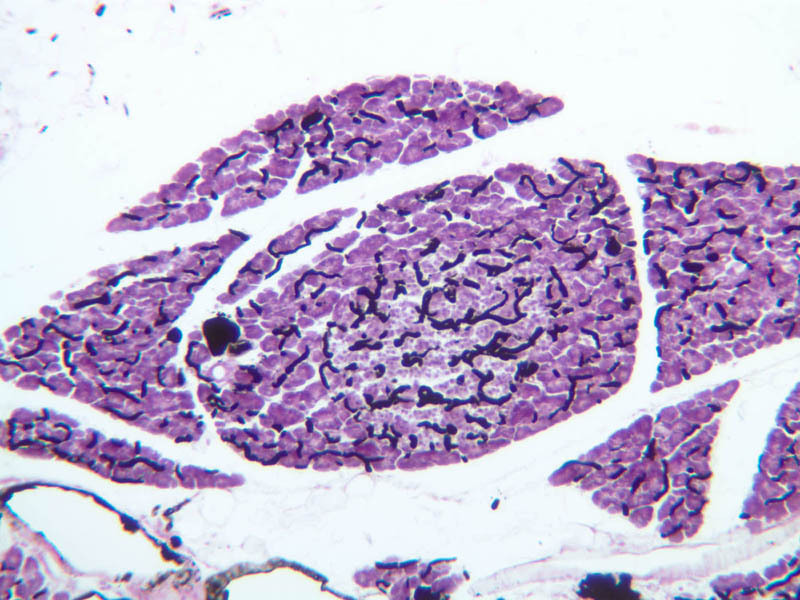 On the silver stained section of stillborn liver (Slide B-32 [10x, 20x, 40x]), examine the meshwork of reticular fibers that form a scaffolding for the hepatocytes and anchoring sites for the basement membrane of the sinusoidal lining. 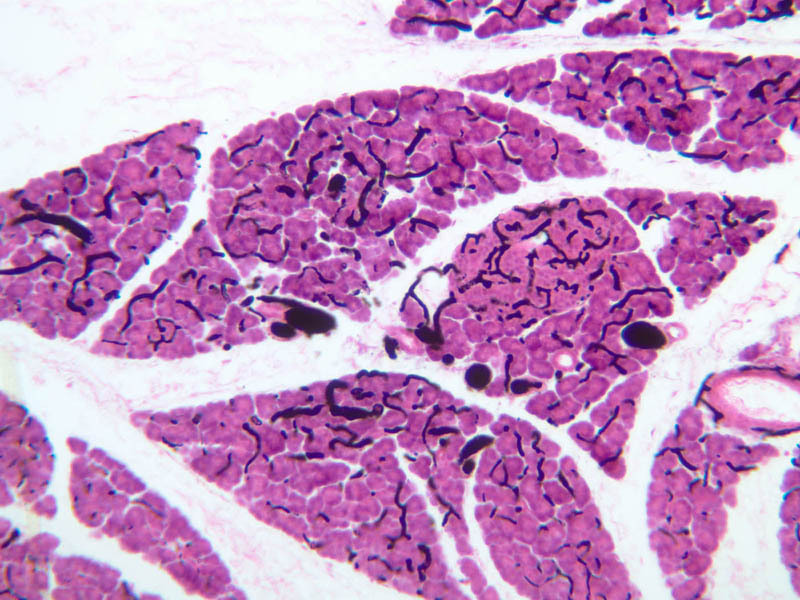 Study the distribution of glycogen in the sections of liver stained by the PAS method on slides B-31 ([2.5x-labeled, 10x, 20x, 40x] [2.5x, 10x, 20x, 40x-labeled]) and B-34 ([2.5x, 10x, 20x, 40x]. 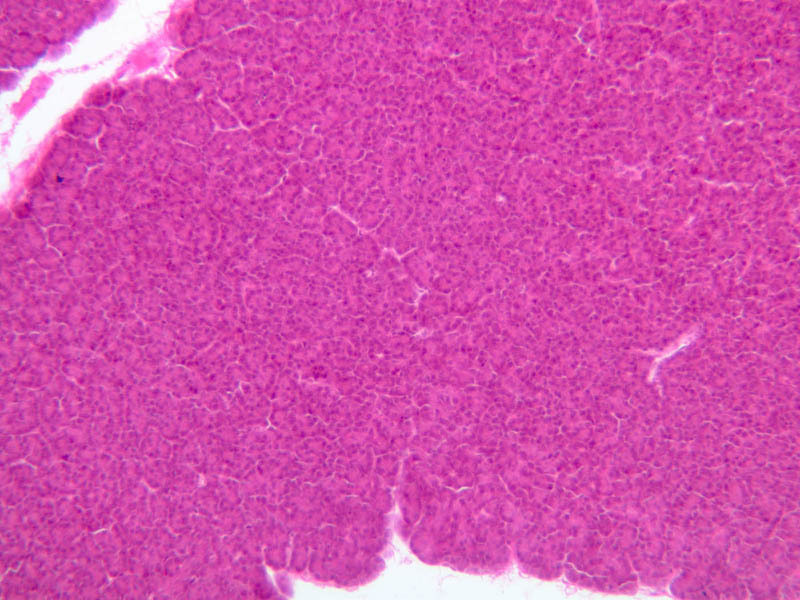 The tissue on slide B-34 was taken from an animal treated with glucagon. Had the specimens on slides B-31 and B-34 been prepared in a carefully controlled way, what difference would you expect to see in their glycogen deposits? 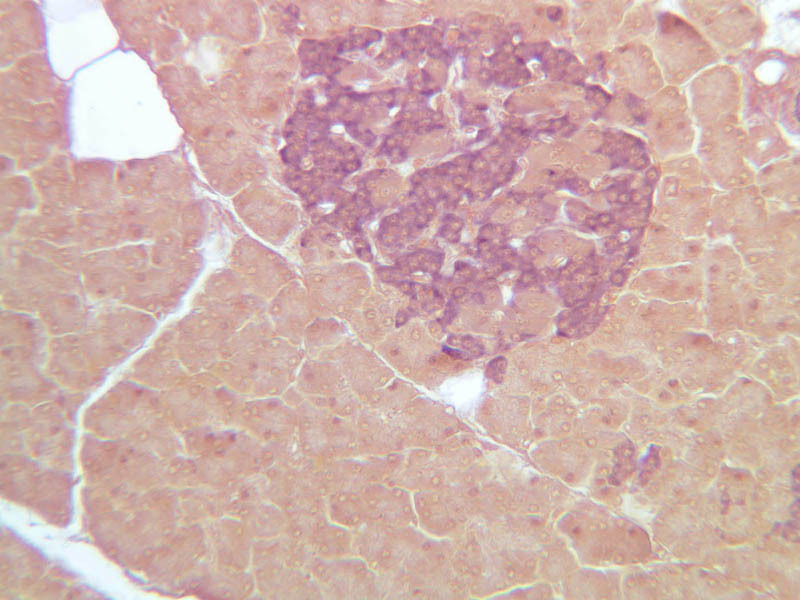 Finally, study H & E and PAS-stained sections at low power and try to visualize how different interpretations of liver organization apply to the specimen you have selected. 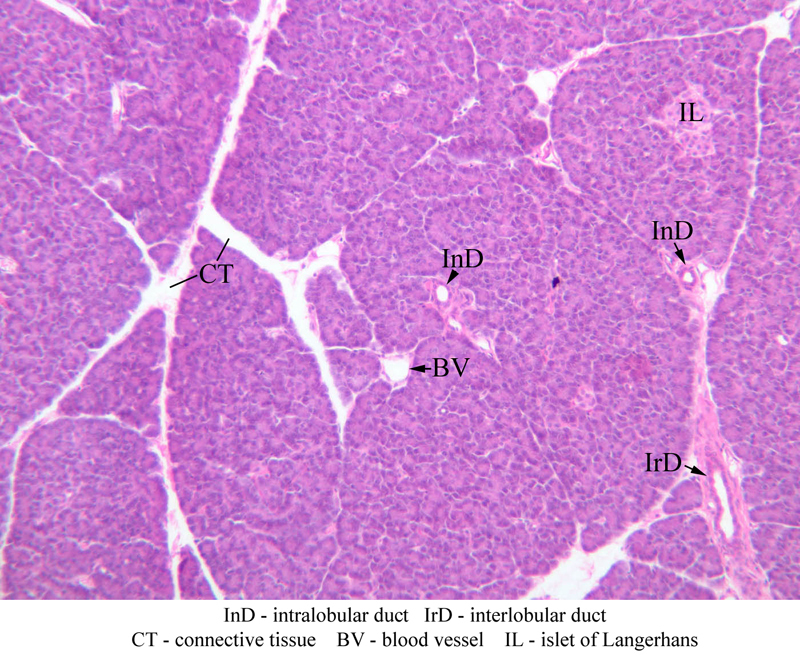 (1) Identify the portal triads that define the boundaries of a “classic” liver lobule (B-29). 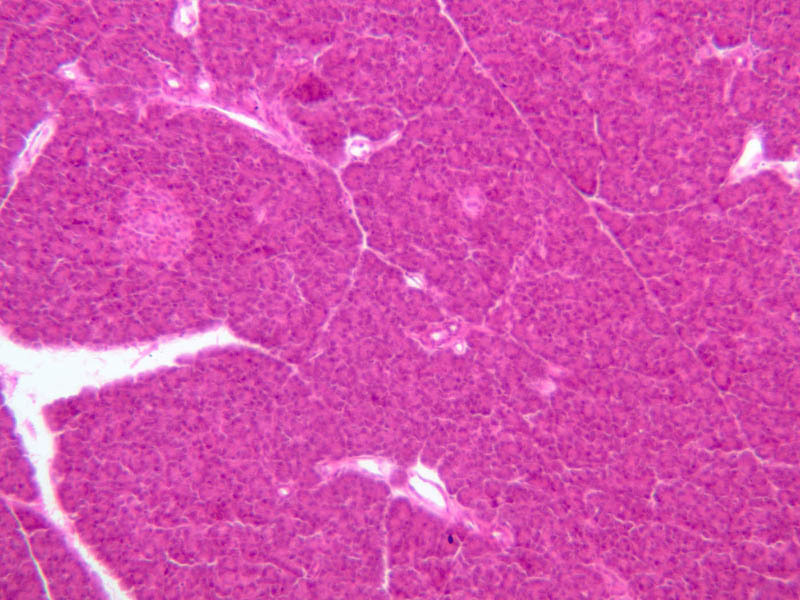 Since it surrounds a central vein, the classic lobule may be thought of as emphasizing the endocrine functions of the liver. (2) Move the slide so that a portal triad is at the center of the microscopic field, then identify the three central veins that define the boundaries of the portal lobule that surrounds the reference portal triad. 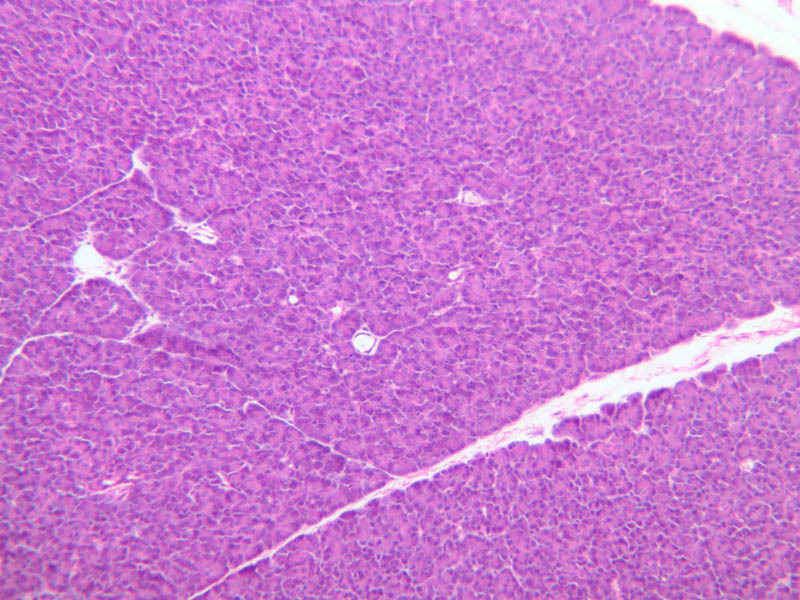 Since an interlobular bile duct is at the center of a portal lobule, the portal lobular interpretation emphasizes the exocrine functions of the liver (B-31). 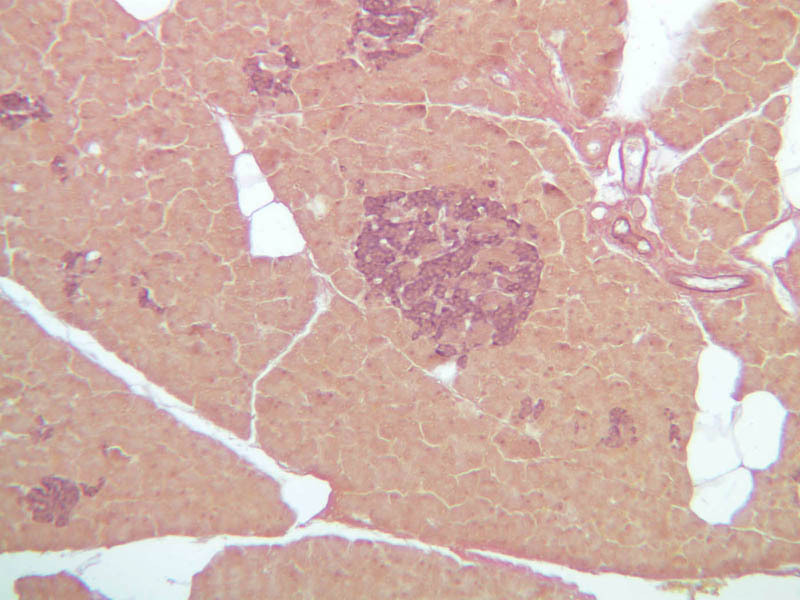 (3) A liver acinus is roughly elliptical in section. Its shorter axis (equator) is defined by the terminal branches of the hepatic artery and portal vein, which course along the boundary between adjacent classic lobules; its longer axis is defined by the two central veins nearest the equator (B-29). 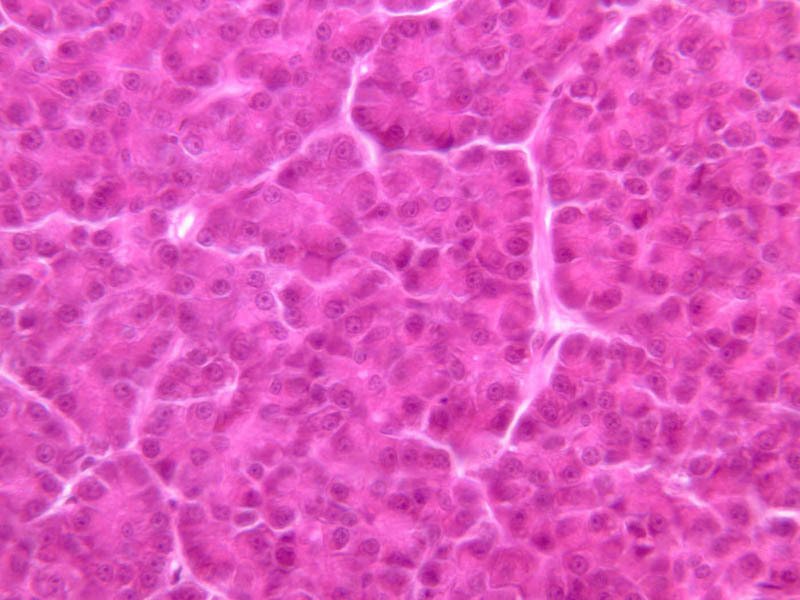 Although it is more difficult to visualize a liver acinus than a classic or portal lobule, the concept of acinar organization is very useful because certain features of liver metabolism best fit the acinar model. 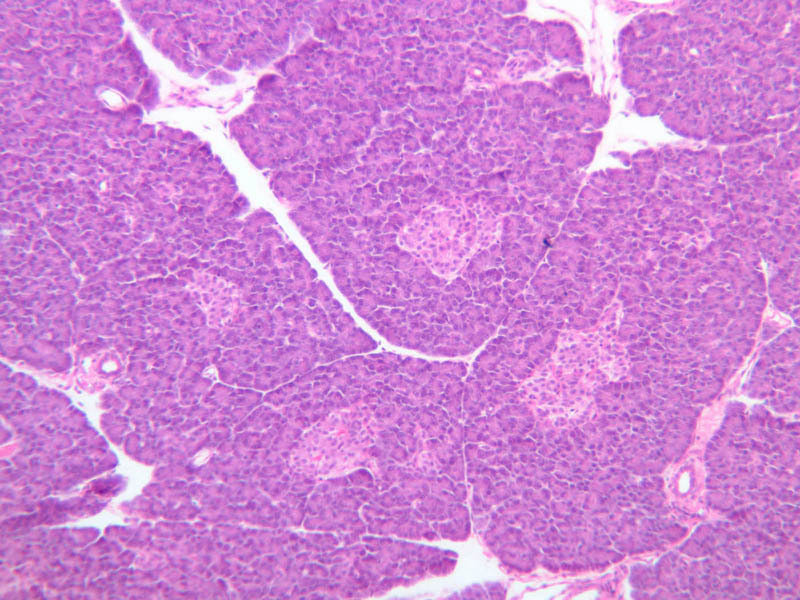 Sections through the wall of the gall bladder appear on slide B-33 (H&E [2.5x, 10x, 20x-labeled, 40x-labeled] [2.5x, 10x, 20x, 40x]). 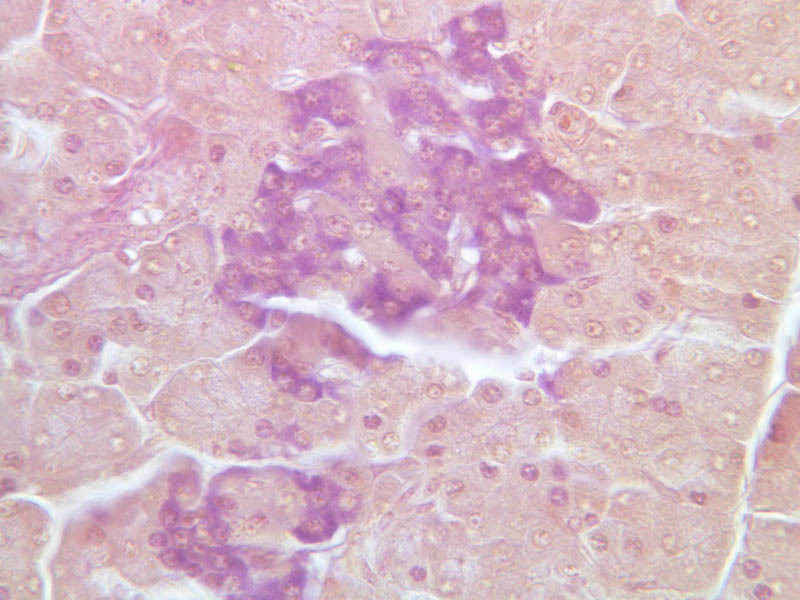 As you examine the epithelium, try to identify the striated border, which functions in absorbing water from the bile. Look for lymphocytes, capillaries and small mucous glands in the lamina propria; lymphocytes often appear to invade the epithelium itself. The gallbladder does not have a discernible submucosa; rather, a muscularis layer, consisting of smooth muscle and connective tissue underlies the mucosa. Some sections may permit identification of both a tunica adventitia, which binds the gallbladder to the liver, and a tunica serosa where the gallbladder faces the peritoneal cavity. 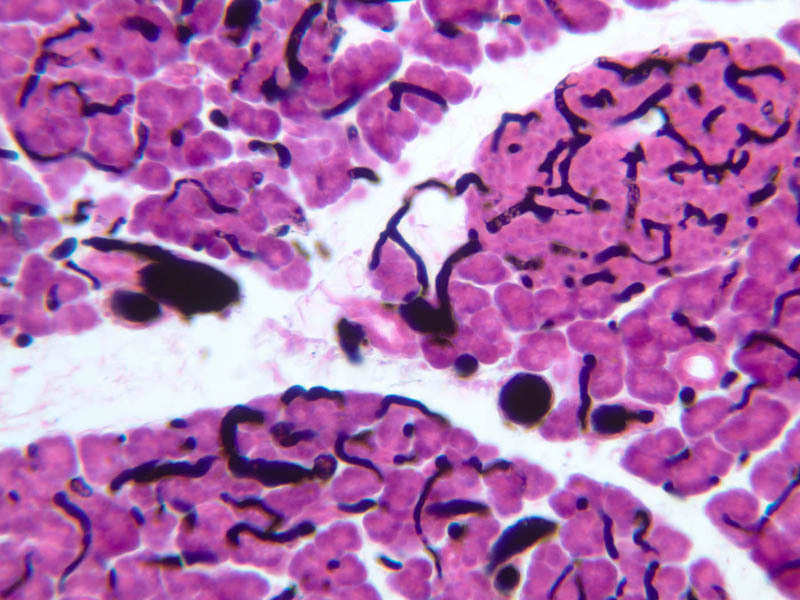 From, Sobotta/Hammersen Histology, Frithjof Hammerson, ed. Third ed., Lea & Febiger, Philadelphia, 1985.